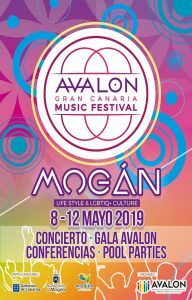 The municipality of Mogán will host from May 8 to 12 the ‘Avalon Gran Canaria Music Festival’, an event that focuses on inclusion, social integration and gender freedom promoted by the Association of Liberal Entrepreneurs and Professionals LGTBIQ + of the Canary Islands. Concerts, gala, conferences and Pool Parties, focused on the LGTBIQ + lifestyle. ‘Avalon Gran Canaria Music Festival’ hopes to consolidate in time and shares the philosophy of the LGTBIQ + sector with other festivals held in the Canary Islands such as the ‘Arona Festival’ in the south of the island of Tenerife or ‘ The Beautiful Island, Love Festival ‘. The Fiestas del Carmen program will include a wide variety of religious, traditional, cultural and festive events for everyone. 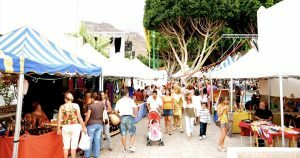 Aquatics, sports, youth and children’s activities, traditional games, concerts, even the now traditional “lowering of the branch” a ritual offering dating back to pre-christian conquest, and of course the main “Romería” pilgrimage processions; all topped off by the annual highlight of maritime processions between Arguineguín and Puerto de Mogán. “La Virgen del Carmen” is the patron saint of sailors, and her feast day is observed in the main Mogán fishing towns of Arguineguín and Puerto de Mogán. The maritime procession and religious service close the annual celebrations which include a variety of events, with one of the highlights being the “Bajada de la Rama” (the lowering of the branch) a tradition unique to the islands, embodied most fervently in the north west of Gran Canaria’s eponymous annual fiestas in Agaete each August, but nowadays prevalent in so many other island fiestas in coastal communities, whereby a tree branch is carried through the streets, to the sound of music and revelry, before being lowered into the sea as a prayer for autumn rains and for fertility. 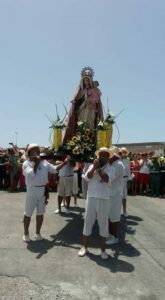 There will be religious ceremonies and a terrestrial “Romería” procession, where sailors dressed in white carry the revered statue of the virgin up to Marañuelas Beach, to pray a rosary. The major event of the celebrations, and the most famous, is the annual maritime procession, when the statue of Our Lady The Virgin is taken form the port of Arguineguín to the port of Mogán followed by a huge array of fishing boats and leisure craft, with a return journey being completed the following Sunday. On that day, sailors and fishermen decorate their boats, in order to celebrate their big day to the rhythm of the music bands, the noise of the motors of the boats and the sound of people enjoying themselves. The most picturesque part of this procession is when the two statues meet on arrival to the fishing port of Mogán. Afterwards there is a procession up to the town square, where there is dancing to the live brass band, and later the procession returns to their starting point. The following week the fiestas continue in Playa de Mogán, also in honour of Nuestra Señora del Carmen, following the same maritime route but in the other direction, from Puerto de Mogán to Arguineguín. The main Romería, the pilgrimage to the Virgen del Carmen de Arguineguín is one of the events that attracts a lot of residents and visitors. In 2019, Tuesday, the 16th is the Day of Our Lady of Carmen is celebrated, which is also a bank holiday in the municipality of Mogán.